This article is about the nursery rhyme. For other uses, see Humpty Dumpty (disambiguation). The character of Humpty Dumpty was popularised in the United States by actor George L. Fox (1825–1877). As a character and literary allusion, he has appeared or been referred to in a large number of works of literature and popular culture, particularly English author Lewis Carroll's Through the Looking-Glass (1872), in which he was described as an egg. The rhyme is listed in the Roud Folk Song Index as No. 13026. William Carey Richards (1818–1892) quoted the poem in 1843, commenting, "when we were five years old ... the following parallel lines... were propounded as a riddle ... Humpty-dumpty, reader, is the Dutch or something else for an egg". According to the Oxford English Dictionary, in the 17th century the term "humpty dumpty" referred to a drink of brandy boiled with ale. The riddle probably exploited, for misdirection, the fact that "humpty dumpty" was also eighteenth-century reduplicative slang for a short and clumsy person. The riddle may depend upon the assumption that a clumsy person falling off a wall might not be irreparably damaged, whereas an egg would be. The rhyme is no longer posed as a riddle, since the answer is now so well known. Similar riddles have been recorded by folklorists in other languages, such as "Boule Boule" in French, "Lille Trille" in Swedish and Norwegian, and "Runtzelken-Puntzelken" or "Humpelken-Pumpelken" in different parts of Germany—although none is as widely known as Humpty Dumpty is in English. The rhyme does not explicitly state that the subject is an egg, possibly because it may have been originally posed as a riddle. There are also various theories of an original "Humpty Dumpty". One, advanced by Katherine Elwes Thomas in 1930 and adopted by Robert Ripley, posits that Humpty Dumpty is King Richard III of England, depicted as humpbacked in Tudor histories and particularly in Shakespeare's play, and who was defeated, despite his armies, at Bosworth Field in 1485. Professor David Daube suggested in The Oxford Magazine of 16 February 1956 that Humpty Dumpty was a "tortoise" siege engine, an armoured frame, used unsuccessfully to approach the walls of the Parliamentary held city of Gloucester in 1643 during the Siege of Gloucester in the English Civil War. This was on the basis of a contemporary account of the attack, but without evidence that the rhyme was connected. The theory was part of an anonymous series of articles on the origin of nursery rhymes and was widely acclaimed in academia, but it was derided by others as "ingenuity for ingenuity's sake" and declared to be a spoof. The link was nevertheless popularised by a children's opera All the King's Men by Richard Rodney Bennett, first performed in 1969. From 1996, the website of the Colchester tourist board attributed the origin of the rhyme to a cannon recorded as used from the church of St Mary-at-the-Wall by the Royalist defenders in the siege of 1648. In 1648, Colchester was a walled town with a castle and several churches and was protected by the city wall. The story given was that a large cannon, which the website claimed was colloquially called Humpty Dumpty, was strategically placed on the wall. A shot from a Parliamentary cannon succeeded in damaging the wall beneath Humpty Dumpty which caused the cannon to tumble to the ground. The Royalists (or Cavaliers, "all the King's men") attempted to raise Humpty Dumpty on to another part of the wall, but the cannon was so heavy that "All the King's horses and all the King's men couldn't put Humpty together again". Author Albert Jack claimed in his 2008 book Pop Goes the Weasel: The Secret Meanings of Nursery Rhymes that there were two other verses supporting this claim. Elsewhere, he claimed to have found them in an "old dusty library, [in] an even older book", but did not state what the book was or where it was found. It has been pointed out that the two additional verses are not in the style of the seventeenth century or of the existing rhyme, and that they do not fit with the earliest printed versions of the rhyme, which do not mention horses and men. This passage was used in Britain by Lord Atkin in his dissenting judgement in the seminal case Liversidge v. Anderson (1942), where he protested about the distortion of a statute by the majority of the House of Lords. It also became a popular citation in United States legal opinions, appearing in 250 judicial decisions in the Westlaw database as of 19 April 2008[update], including two Supreme Court cases (TVA v. Hill and Zschernig v. Miller). "That's just what I complain of," said Humpty Dumpty. "Your face is the same as everybody has—the two eyes,—" (marking their places in the air with his thumb) "nose in the middle, mouth under. It's always the same. Now if you had the two eyes on the same side of the nose, for instance—or the mouth at the top—that would be some help." Humpty Dumpty has become a highly popular nursery rhyme character. American actor George L. Fox (1825–77) helped to popularise the character in nineteenth-century stage productions of pantomime versions, music, and rhyme. The character is also a common literary allusion, particularly to refer to a person in an insecure position, something that would be difficult to reconstruct once broken, or a short and fat person. 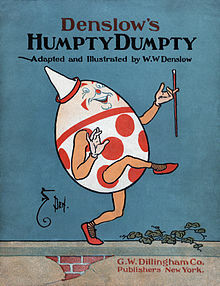 Humpty Dumpty has been used in a large range of literary works in addition to his appearance as a character in Through the Looking-Glass, including L. Frank Baum's Mother Goose in Prose (1901), where the rhyming riddle is devised by the daughter of the king, having witnessed Humpty's "death" and her father's soldiers' efforts to save him. In Neil Gaiman's early short story The Case of the Four and Twenty Blackbirds, the Humpty Dumpty story is turned into a film noir-style hardboiled crime story, involving other characters from popular nursery rhymes. Robert Rankin used Humpty Dumpty as one victim of a serial fairy-tale character murderer in The Hollow Chocolate Bunnies of the Apocalypse (2002). Jasper Fforde included Humpty Dumpty in his novels The Well of Lost Plots (2003) and The Big Over Easy (2005), which use him respectively as a ringleader of dissatisfied nursery rhyme characters threatening to strike and as the victim of a murder. Humpty Dumpty appears as a lead villain in the DreamWorks animation Puss in Boots (2011). The 1925 song "I'm Sitting on Top of the World", most notably sung by Dean Martin, Doris Day and Bobby Darin, mentions Humpty Dumpty twice in its lyrics, saying "just like Humpty Dumpty, I'm gonna fall". The rhyme has also been used as a reference in more serious literary works, including as a recurring motif of the Fall of Man in James Joyce's 1939 novel Finnegans Wake. Robert Penn Warren's 1946 American novel All the King's Men is the story of populist politician Willie Stark's rise to the position of governor and eventual fall, based on the career of the infamous Louisiana Senator and Governor Huey Long. It won the 1947 Pulitzer Prize and was twice made into a film in 1949 and 2006, the former winning the Academy Award for best motion picture. This was echoed in Carl Bernstein and Bob Woodward's book All the President's Men, about the Watergate scandal, referring to the failure of the President's staff to repair the damage once the scandal had leaked out. It was filmed as All the President's Men in 1976, starring Robert Redford and Dustin Hoffman. Similarly, Humpty Dumpty is referred to in Paul Auster's 1985 novel City of Glass, when two characters discuss him as "the purest embodiment of the human condition" and quote extensively from Through the Looking Glass. Luis d'Antin van Rooten's 1967 book Mots d'Heures, a collection of homophonically translated poetry, includes a version of the rhyme in nonsensical French text, beginning "Un petit d'un petit, S'étonne aux Halles...". In the Dolly Parton song Starting Over Again, it's all the king's horses and all the king's men who can't put the divorced couple back together again. In an extra verse in one version of ABBA's On and On and On, Humpty Dumpty is mentioned as being afraid of falling off the wall. Humpty Dumpty has been used to demonstrate the second law of thermodynamics. The law describes a process known as entropy, a measure of the number of specific ways in which a system may be arranged, often taken to be a measure of "disorder". The higher the entropy, the higher the disorder. After his fall and subsequent shattering, the inability to put him together again is representative of this principle, as it would be highly unlikely (though not impossible) to return him to his earlier state of lower entropy, as the entropy of an isolated system never decreases. ^ Paul McGuire (26 November 2012). "Winning the Battlefield of the Future". News with News. Retrieved 18 September 2015. ^ I. Opie and P. Opie, The Oxford Dictionary of Nursery Rhymes (Oxford: Oxford University Press, 1951, 2nd edn., 1997), ISBN 0-19-869111-4, pp. 213–5. ^ J.Smith, Poetry Writing (Teacher Created Resources, 2002), ISBN 0-7439-3273-0, p. 95. ^ P. Hunt, ed., International Companion Encyclopedia of Children's Literature (London: Routledge, 2004), ISBN 0-203-16812-7, p. 174. ^ J. J. Fuld, The Book of World-Famous Music: Classical, Popular, and Folk (Courier Dover Publications, 5th edn., 2000), ISBN 0-486-41475-2, p. 502. ^ Emily Upton (24 April 2013). "The Origin of Humpty Dumpty". What I Learned Today. Retrieved 19 September 2015. ^ a b c d e f Opie & Opie (1997), pp. 213–5. ^ Richards, William Carey (March – April 1844). "Monthly chat with readers and correspondents". The Orion. Penfield, Georgia. II (5 & 6): 371. ^ Joseph Ritson, Gammer Gurton's Garland: or, the Nursery Parnassus; a Choice Collection of Pretty Songs and Verses, for the Amusement of All Little Good Children Who Can Neither Read Nor Run (London: Harding and Wright, 1810), p. 36. ^ J. O. Halliwell-Phillipps, The Nursery Rhymes of England (John Russell Smith, 6th edn., 1870), p. 122. ^ E. Partridge and P. Beale, Dictionary of Slang and Unconventional English (Routledge, 8th edn., 2002), ISBN 0-415-29189-5, p. 582. ^ Lina Eckenstein (1906). Comparative Studies in Nursery Rhymes. pp. 106–107. OL 7164972M. Retrieved 30 January 2018 – via archive.org. ^ E. Commins, Lessons from Mother Goose (Lack Worth, Fl: Humanics, 1988), ISBN 0-89334-110-X, p. 23. ^ "Juvenile Biography No IV: Humpty Dumpty". Punch. 3: 202. July – December 1842. ^ "Nursery Rhymes and History", The Oxford Magazine, vol. 74 (1956), pp. 230–32, 272–74 and 310–12; reprinted in: Calum M. Carmichael, ed., Collected Works of David Daube, vol. 4, "Ethics and Other Writings" (Berkeley, CA: Robbins Collection, 2009), ISBN 978-1-882239-15-3, pp. 365–66. ^ Alan Rodger. "Obituary: Professor David Daube". The Independent, 5 March 1999. ^ I. Opie, 'Playground rhymes and the oral tradition', in P. Hunt, S. G. Bannister Ray, International Companion Encyclopedia of Children's Literature (London: Routledge, 2004), ISBN 0-203-16812-7, p. 76. ^ I. and P. Opie, eds, The Oxford Dictionary of Nursery Rhymes (Oxford: Oxford University Press, 1997), ISBN 978-0-19-860088-6, p. 254. ^ C. M. Carmichael (2004). Ideas and the Man: remembering David Daube. Studien zur europäischen Rechtsgeschichte. 177. Frankfurt: Vittorio Klostermann. pp. 103–104. ISBN 3-465-03363-9. ^ "Sir Richard Rodney Bennett: All the King's Men". Universal Edition. Retrieved 18 September 2012. ^ a b "Putting the 'dump' in Humpty Dumpty" The BS Historian. Retrieved 22 February 2010. ^ A. Jack, Pop Goes the Weasel: The Secret Meanings of Nursery Rhymes (London: Allen Lane, 2008), ISBN 1-84614-144-3. ^ "The Real Story of Humpty Dumpty, by Albert Jack" Archived 27 February 2010 at the Wayback Machine, Penguin.com (USA). Retrieved 24 February 2010. ^ F. R. Palmer, Semantics (Cambridge: Cambridge University Press, 2nd edn., 1981), ISBN 0-521-28376-0, p. 8. ^ L. Carroll, Through the Looking-Glass (Raleigh, NC: Hayes Barton Press, 1872), ISBN 1-59377-216-5, p. 72. ^ G. Lewis (1999). Lord Atkin. London: Butterworths. p. 138. ISBN 1-84113-057-5. ^ Martin H. Redish and Matthew B. Arnould, "Judicial review, constitutional interpretation: proposing a 'Controlled Activism' alternative", Florida Law Review, vol. 64 (6), (2012), p. 1513. ^ A. J. Larner (1998). "Lewis Carroll's Humpty Dumpty: an early report of prosopagnosia?". Journal of Neurology, Neurosurgery, and Psychiatry. 75 (7): 1063. doi:10.1136/jnnp.2003.027599. PMC 1739130. PMID 15201376. ^ L. Senelick, The Age and Stage of George L. Fox 1825–1877 (University of Iowa Press, 1999), ISBN 0877456844. ^ E. Webber and M. Feinsilber, Merriam-Webster's Dictionary of Allusions (Merriam-Webster, 1999), ISBN 0-87779-628-9, pp. 277–8. ^ L. Frank Baum, Mother Goose in Prose (Mineola, NY: Courier Dover, 2002), ISBN 0-486-42086-8, pp. 207–20. ^ Neil Gaiman, The Case of the Four and Twenty Blackbirds, first published in 1984 in Knave, available online. ^ R. Rankin, The Hollow Chocolate Bunnies of the Apocalypse (London: Gollancz, 2009), ISBN 0-575-08543-6. ^ J. Fforde, Well of Lost Plots (London: Viking, 2004), ISBN 0-670-03289-1. ^ J. Fforde, The Big Over Easy: A Nursery Crime (London: Penguin, 2006), ISBN 0-14-303723-4. ^ "Dean Martin - I'm Sitting On Top Of The World Lyrics - MetroLyrics". www.metrolyrics.com. ^ J. S. Atherton, The Books at the Wake: A Study of Literary Allusions in James Joyce's Finnegans Wake (1959, SIU Press, 2009), ISBN 0-8093-2933-6, p. 126. ^ G. L. Cronin and B. Siegel, eds, Conversations With Robert Penn Warren (Jackson, MS: University Press of Mississippi, 2005), ISBN 1-57806-734-0, p. 84. ^ M. Feeney, Nixon at the Movies: a Book About Belief (Chicago IL: University of Chicago Press, 2004), ISBN 0-226-23968-3, p. 256. ^ P. Auster, The New York Trilogy (London: Faber, 1987). p. 81. ^ R. Kienzle, Southwest Shuffle: Pioneers of Honky Tonk, Western Swing, and Country Jazz (London: Routledge, 2003), ISBN 0-415-94103-2, p. 134. ^ B. L. Cooper, Popular Music Perspectives: Ideas, Themes, and Patterns in Contemporary Lyrics (Popular Press, 1991), ISBN 0-87972-505-2, p. 60. ^ "Ornette Coleman – Humpty Dumpty (LP Version)". Amazon.com. Retrieved 6 July 2010. ^ "Chick Corea – The Mad Hatter". Amazon.com. Retrieved 6 July 2010. ^ Bob Mendelsohn (9 September 2010). "Starting Over" (PDF). Jews for Jesus Australia. Retrieved 19 September 2015. ^ Simon Sheridan. "The Complete Abba". Retrieved 19 September 2015. ^ Chang Kenneth (30 July 2002). "Humpty Dumpty Restored: When Disorder Lurches Into Order". The New York Times. Retrieved 2 May 2013. ^ Lee Langston. "Part III – The Second Law of Thermodynamics" (PDF). Hartford Courant. Retrieved 2 May 2013. ^ W.S. Franklin (March 1910). "The Second Law Of Thermodynamics: Its Basis In Intuition And Common Sense". The Popular Science Monthly: 240. This page was last edited on 16 April 2019, at 23:03 (UTC).